This is my last large indoor sowing. Thanks for the reminder....it's time for me to start my warm weather crops, too! That's quite a selection! Must get to these too, I think I have them scheduled for the 26th. Where do you get your seed labels? i've been looking for some like yours. You have been very busy this week! I need to get my warm weather crops started this week also. Nice selection. The seed labels are at my local True Value hardware store. My local garden center (Bonny's in Cambridge) also has them. I think 6 cents each. 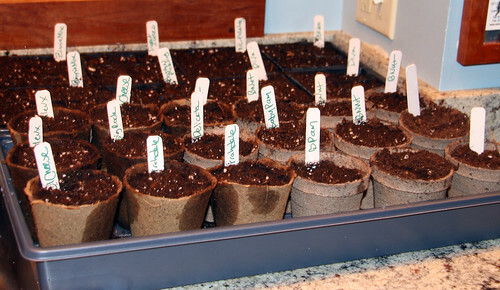 I like the tiny ones for indoor seeding and bigger ones for outdoor labeling. You can mail order them too from places like Johnny's but you need to buy lots. Betsy, Everything gets leggy indoors without lights. Often with lights it gets leggy too. But they'll be happy soon when they go outside. Try putting them out to sun on these bright warm days. Someday try a $10 fluorescent shop light fixture with two fluorescent bulbs ($5-8 each) suspended 1 inch above the plants. Or a cold frame. I LOVE the way my big cold frame is working for my seedlings this year. I usually plant zinnias late, 2-3 weeks before the last frost, with the cukes and squashes, because they grow fast and need warmth and lot of light. What do you use for seed starting mix? I'm not crazy about the stuff that I've been using. I like MiracleGro seed started mix. It works well. I get a giant bag at Costoco when they get it in stock in the spring. Other gardeners like making their own mix, which is less costly and you know what's in it, but it takes more work.